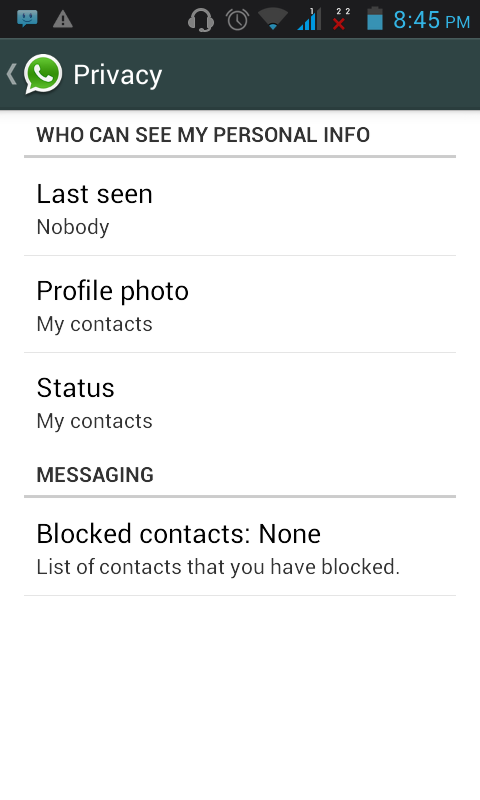 WhatsApp for Android users can now hide ‘last seen‘ notification (status), profile picture and personal status. 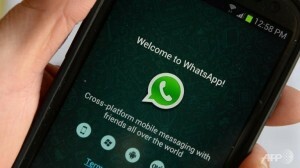 After the big 19 billion deal with Facebook, WhatsApp have made a new major update for users. So they need to share their joy to their users too. Previous this feature was only available for iOS users. Now users have the control who can see his ‘last seen’ and ‘online’ status. Android users were depending on other third party apps like ‘WhatsApp Hide LastSeen‘ , ‘Hide whatsapp status‘ etc to hide this status. Now those apps will be out of scene as whatsapp have the settings in their new update. Android users where demanding for this feature from the beginning of WhatsApp life. If you choose Everyone the status will be displayed to everyone who have your contact number in their phone. 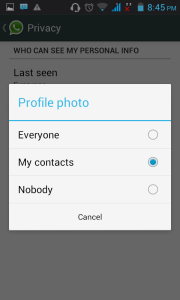 Selecting ‘My Contacts’ will restrict the status display to contacts who are in your whatsapp contacts list. Selecting ‘Nobody’ will hide your status from all whatsapp users. 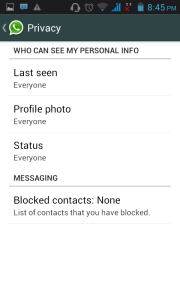 Previous in android if we need to hide the status without using another app we should block that user. The same settings is now available for profile picture and personal status message. 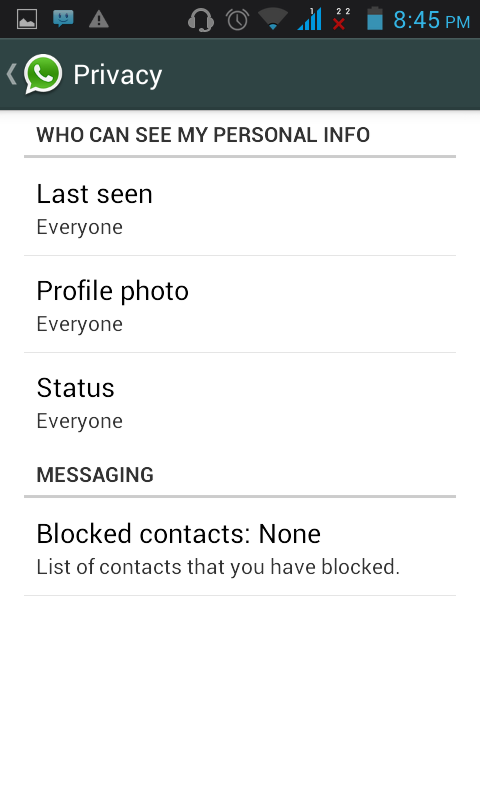 Every WhatsApp user will love this new privacy settings update. Other features include changing your number without losing your personal and group messages & an option to pay WhatsApp renewal fees for a friend. Currently this new update is not available in Google play store but officially released in WhatsApp website. You can download the apk file from whatsapp website. If unable to download from above link use this mirror. 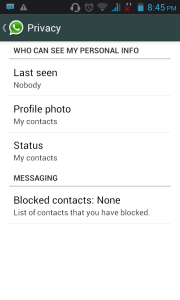 How to block ‘last seen’ status in WhatsApp ? Go to the link from your mobile browser and download. Else download in your computer and transfer to your phone. Step 2 ) Click on the APK file and click on Install. If it says ‘Install Blocked’ go to settings > Security and tick check-box next to “Allow installation from unknown sources”. Then come back and click on APK file again. If it asks for “Replace Application”, click OK. 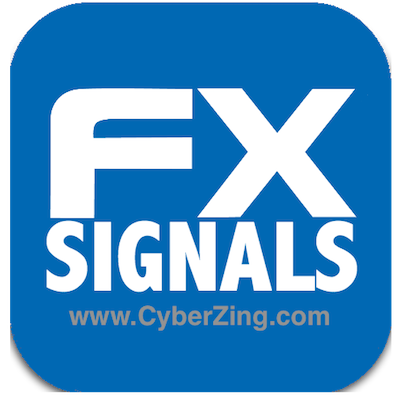 The installation process will begin and WhatsApp application will be installed within few seconds. Don’t panic. You will not lose any of your previous chat or settings. Congratulation!! You have successfully installed new WhatsApp with new privacy settings. Go to Settings in your WhatsApp screen and choose “Account” settings. Choose the option “Privacy” and you can see the options to disable “Last Seen At”, Profile Pic and Status.